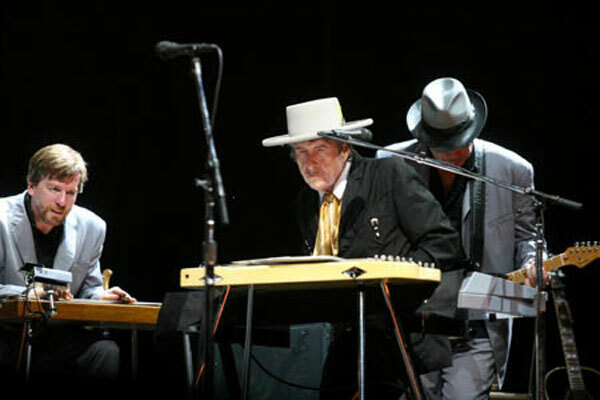 For the past three years Dylan was rarely ever seen performing on stage with a guitar. The typical set-up was him playing on the left side of the stage standing in front of a keyboard, the other musicians on their usual spots. Only for two or three occasions a night he moved into the center of the stage to play his harp. Something is happening and we don't know what it is, do you Mr. Jones? Why is he exchanging his guitars for a keyboard? The most likely reason is that Bob might be suffering from arthritis. Also his sets are no longer than 90 minutes, about 30 minutes less than a usual rock concert. But what's "usual" in the world of Bob Dylan anyway? Isn't it the variety of styles, performances and interpretations of songs that fascinates us the most? And having heard a few of his latest live sets, he seems to enjoy the jam-session like stage set-up. There is no electric and acoustic set anymore and his set-list mainly includes songs from the mid-60s and his latest two albums. Bob might not be a piano man like Billy Joel or Elton John, but the new arrangements are interesting to an audience that has heard the songs a million times and thinks to know them by heart.